Aquarium researchers and staff are on expedition to the remote Phoenix Islands Protected Area (PIPA) to study the natural history of the islands, surrounding reefs and connecting open water ecosystems. Research on the 2015 expedition will directly inform the management and maintenance of this world-renowned MPA. 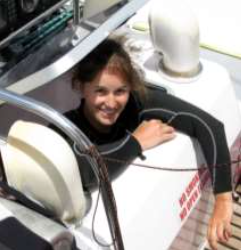 Today's post comes from Liz Drenkard, PhD, who will be collecting temperature and current profile information to study connections between PIPA and other Pacific reef corals. We're currently at port in Apia, Samoa, anticipating a timely departure for the Phoenix Islands! Both crew and scientists are making final equipment checks in preparation to get underway. For the ship's medical doctor, Craig Cook, this means testing the onboard re-compression chamber to ensure we are ready for any SCUBA-related emergencies. SCUBA stands for Self Contained Underwater Breathing Apparatus, meaning we can bring an air supply with us to stay underwater to do our research. SCUBA diving is essential for studying PIPA's reef ecosystems, allowing us to do everything from assessing water chemistry and recording ecosystem conditions to observing fish populations and collecting coral samples. However, there are inherent risks of breathing pressurized air underwater, and diver safety is paramount. Our bodies need oxygen to function. When we breath, atmospheric gases diffuse across the tissue layer in our lungs into our blood stream where it gets circulated throughout our bodies. Our cells pull out the oxygen they need that's dissolved in our blood and return carbon dioxide, which gets pumped back to the lungs and exhaled. This whole process is called respiration. However, a large percentage (~78%) of the air we breathe is nitrogen gas (N2), which is inert and doesn't really affect us at surface sea-level pressures. But when we descend and breath air from our tanks, the combined pressure of the atmosphere, plus the water above us forces more N2 to be absorbed from our blood into our tissues (e.g., muscle, fat). This isn't inherently dangerous but it is critical that we come back up to the surface slowly so that our bodies have enough time to gradually "vent off" the extra N2 that was stored in our bodies while under pressure. A rapid ascent or decrease in pressure can result in the formation of problematic N2 bubbles in the blood and tissues, because that extra N2 can't stay dissolved in the blood and tissues at the lower pressures. This condition is called 'decompression sickness' (DCS) or--more commonly, the bends--and victims exhibit a wide range of symptoms from minor aches and pains to more severe cases where nitrogen bubbles fatally block blood flow to the brain. Our first line of defense against DCS is, of course, avoiding it entirely by making slow and controlled ascents. We also incorporate safety stops into our dives, where we pause a few meters below the surface to let our bodies adjust to a pressure that's lower than it was at our maximum dive depth but higher than at the surface. If a diver is suspected of having DCS, there are two primary means of eliminating excess nitrogen from their systems: first we have them breath pure oxygen gas (O2). With no N2 in the lungs, N2 diffuses out of the body more rapidly than when breathing regular air that is composed of mostly N2. This is sufficient to treat minor DCS cases, but sometimes it is necessary to re-pressurize a diver's body. This forces the N2 bubbles back into solution and then we can very gradually return their bodies back to surface-level pressures. That's where the re-compression chamber comes into play. Chambers come in all shapes and sizes, but the basic idea is that it's an enclosed space that can be pressurized much like an airplane cabin. 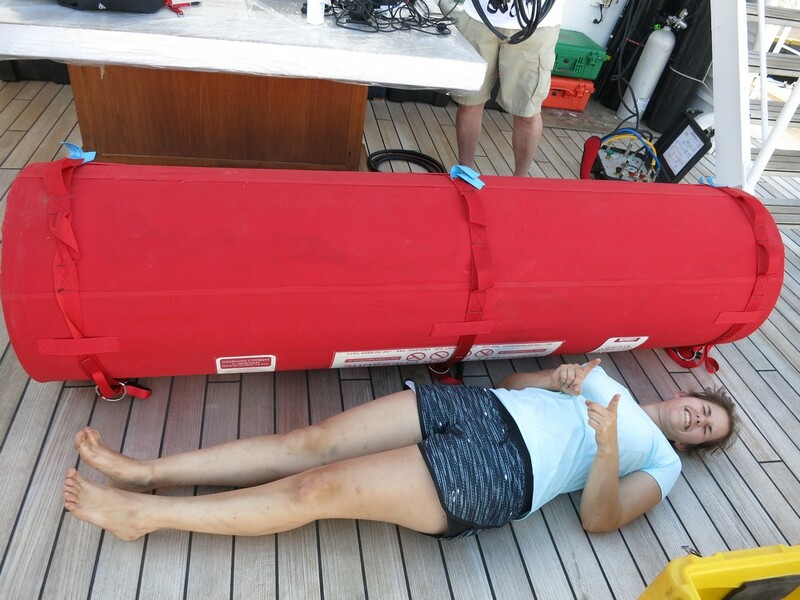 Coastal divers can usually reach recompression facilities on land—but when traveling to remote locations such as PIPA, we have to bring a portable chamber with us on board the ship. Our chamber is a red cylinder, that—when fully inflated—is just long enough for a person to lie down in. Sort of like a human sushi roll. A person in need of recompression wiggles into the chamber and gets outfitted with an O2 mask, and a microphone and headphones so they can communicate with folks on the outside. The ends of the chamber are then sealed off with the person inside, and the pressure of the chamber is increased and dropped back to sea-level pressure over the course of several hours. Given our divers' extensive safety training and experience, it's unlikely the chamber will make a repeat appearance on this trip, but the equipment check was a great opportunity for us to learn how to set it up and for Dr. Craig to ensure we have a safe and functional chamber for this epic adventure! Liz Drenkard, PhD, studies the response of ocean dynamics, ocean biogeochemistry and living marine resources to CO2-induced climate change, with implications for conservation. She is currently a postdoctoral researcher at Rutgers University working with Dr. Enrique Curchitser and the Environmental Systems Modeling group to use high resolution ocean models to understand reef ecosystem vulnerabilities or resilience to climate variability. 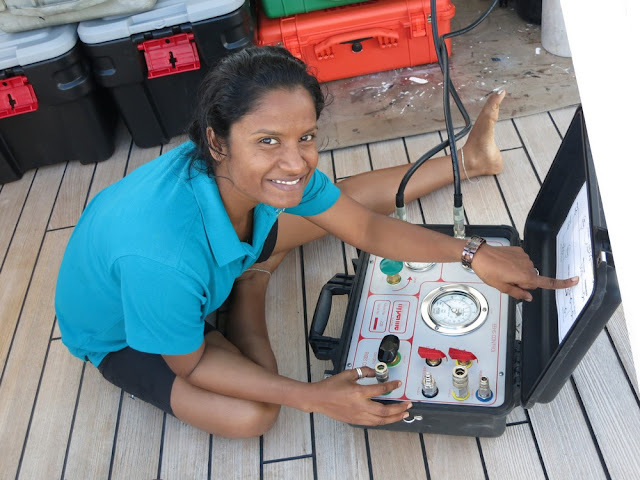 During this expedition, she will be collecting temperature and current profile information to validate the model we will use to study the connectivity between PIPA and other Pacific reef corals. 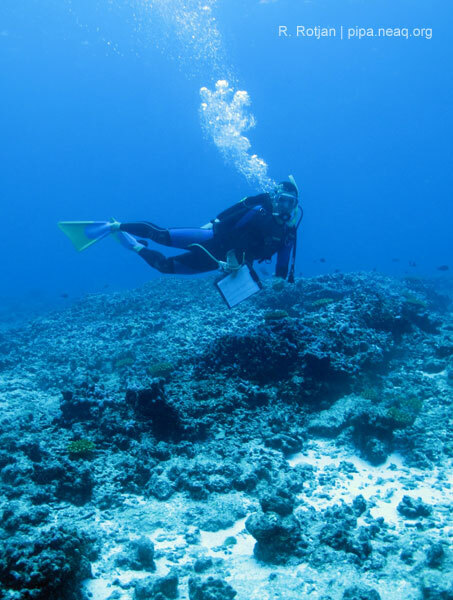 Her graduate research, which focused on the role of nutrition in coral calcification response to acidification and the implications for reefs in the equatorial Pacific, was conducted at WHOI under the mentorship of Drs. Anne Cohen, Dan McCorkle and Kris Karnauskas. Her outreach efforts include serving as a science liaison for the National Network for Ocean and Climate Change Interpretation; In the past, she worked as an assistant aquarist at the New England Aquarium and is currently a volunteer for The Raptor Trust: a wild avian rehabilitation center in NJ.